A 20-year-old queer woman in the UK is appealing for help to send out holiday cards to LGBTI people who feel isolated from their families after coming out. The project needs money, but it also needs people to send in cards to forward. The Rainbow Cards Project is a small, grassroots initiative. It was launched in 2017 by Elena Roberts-Wright, who prefers to simply go by the name El. Its aim is simple: to send cards to those whose families don’t send them cards. ‘Unfortunately, too many LGBTQ+ people face prejudice, ignorance and sometimes even outright abuse from their family, simply for being who they are,’ says a statement on its website. El told Gay Star News more about how she came up with the idea. ‘It was coming up to Christmas 2016 and I was thinking about how excited I was to write Christmas cards to all my family. ‘I have multiple chronic illnesses that had become severe enough the year before I had been too unwell to write any, but that year I was doing a little better and was exciting about the prospect of sending some. ‘Earlier that year I had also come out to my parents, and several members of my extended family. As I was thinking about sending my family cards a horrible thought dawned on me: how it would feel if my coming out had been met with a different reaction and I had received rejection instead of acceptance. The project simply started after El posted a couple of tweets. These said, ‘If your family have stopped sending you Christmas cards to you since you came out, message me and I will send you a card myself. ‘From just a couple of tweets, I sent over 30 cards to people in nine different countries. The Rainbow Cards Project now sends card to countries as diverse as Russia, Saudi Arabia, Mexico, Nicaragua, Singapore, India, the US and UK. Recipients can state if they don’t want anything LGBTI related mentioned in the cards they receive. People can register to receive a card, or can send a card via the details on the site. Alternatively, they can just donate to help the operation to continue running. It’s not the first non-profit organization to run card campaigns: Amnesty International also often encourages its members to send cards to prisoners of conscience to help boost their morale and reassure them that they haven’t been forgotten. 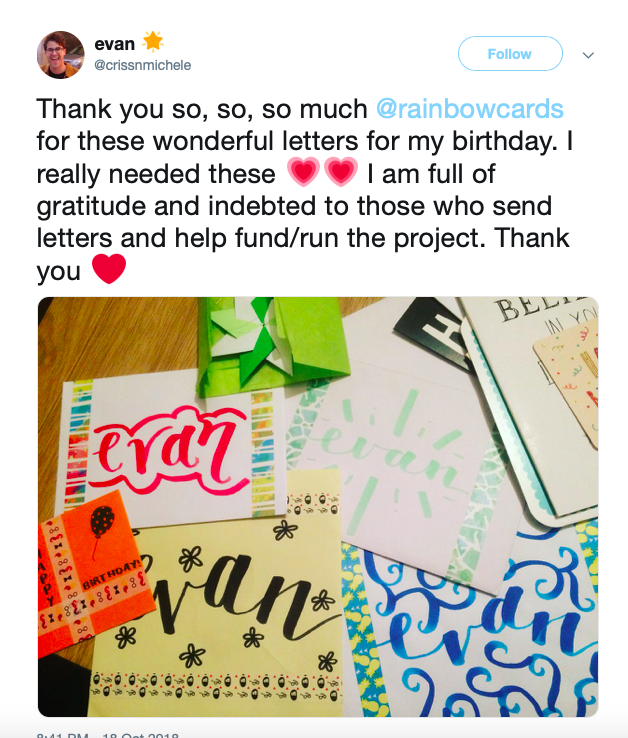 The Rainbow Cards Project sends birthday cards to recipients, and also a holiday card. This is mainly Christmas cards if recipients celebrate Christmas. However, they can also put ask to receive a card on a different holiday. Two of the people who have received cards told Gay Star News about the impact they’d had. Both wish to remain anonymous. The first, a 17-year-old girl in the United States, said they received five Rainbow Cards on their birthday earlier this year: ‘I think the project is a great way to reach out to members of the LGBTQ+ and it provides a sense of safety or reassurance to those who may not feel accepted by the people in their lives. ‘Love can be hard to find, but hearing that you are loved by people you don’t even know is so so powerful. A 17-year-old who identifies as trans and non-binary told Gay Star News they had been outed to their parents earlier this year. Their folks were not supportive. ‘When I didn’t get the support I needed from my family I felt horrible and guilty for being… me! I discovered the project and suddenly life felt a little less difficult. I knew I wasn’t alone. At the moment, Rainbow Cards is very much run by El from her home in Devon, England. It’s not a registered charity as its turnover is less than £5,000 a year (below the UK threshold to register a charity), but El hopes the project will grow. It’s in the process of being registered as a charitable cause with HMRC in order to claim back Gift Aid donations. In order to help the project continue over the coming holiday season, she’s set up a GoFundMe campaign to help raise the necessary £1,000 ($1,277/€1,130) needed for this year’s expected card run. The Rainbow Cards campaign is being promoted by GoFundMe. If you are not able to donate money, you can still show your support by simply sending a card. This can be shop-bought or home-made. The Rainbow Project has a list of recipients (first names only), with a very brief line of information about them. In many cases, this might just be a preferred pronoun. If you don’t want to pick a recipient, you can send a general message of support, which will be sent on to someone on the list. Be fun, creative and supportive! I ask if El worries that she may not be able to keep up with the requests for cards. If demand outstrips supply? ‘That worry is definitely at the back of my mind, especially since I run this project alone while dealing with multiple complex disabilities that I never know what might happen with. ‘My biggest concern as of right now though is funds, because so far our growth in recipients hasn’t really been matched by a growth in funding. But hopefully as the project gets more exposure we’ll receive more donations. ‘Ultimately, I just want to keep this project going for as long as is feasible, and even if some day I can’t meet demand, at least I know I’ve positively impacted 400 more lives than I would have done if I never started this project. More details at Rainbow Card Project and follow on Twitter at @rainbowcards.